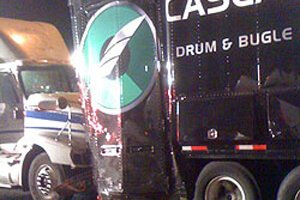 No injuries were reported after the Cascades' equipment truck was rear-ended while passing through Waco, Texas on its way to San Antonio late Thursday night. Corps management reports that the truck's driver is unhurt as are all corps members who were traveling on motor coaches well behind the equipment truck at the time. According to a Cascades press release: "The truck is currently being taken to a secure storage location, and we will assess the damage in the morning in the daylight. Also at this time we are unsure of what kind of equipment damage there is to marching equipment as the battery and many brass instruments were stored in the back end of the equipment truck."